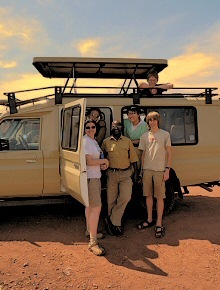 Day 1; To Queen Elizabeth National Park. You will have your breakfast very early and then drive into the park for your early morning game drive. You will search for the wildlife like the lions, hyenas, you will see the Uganda Kobs, lots of elephants, buffaloes, hippos and crocodiles by the waters etc. This search should be at least end before noon and then return to the lodge to relax as you wait for your lunch. In the afternoon you will go for a launch cruise along the Kazinga channel the waterway that joins Lake Edward to Lake George and see the hippos in big numbers, crocodiles, the buffaloes, with elephants at the shores as they take water and graze. There will also be birds and after the two hours, you will be returning to the lodge for dinner and the night. Breakfast will be served very early and then meet your guide so he can drive to Kyambura Gorge which is a home to the chimpanzees for trekking. You be briefed before you walk into the forest and you can expect to see more than the chimpanzees, other primates like the Black and white Colobus monkeys will be spotted and other animals like antelopes, hyenas, Lion and many others in the middle of savanna grassland. This gorge is also a home of very many bird species; bird watchers could have fun when they visit that forest. You will go back to the lodge for your lunch and the go visit the crater lakes region. Dinner will be back at your lodge. After breakfast, you will pick your hiking gears, your lunch boxes too and then go for briefing at the ranger station. 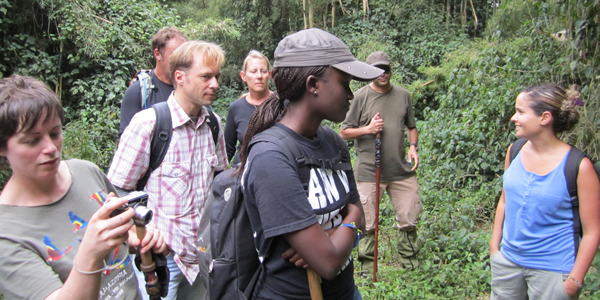 After briefing, you will go gorilla trekking with the help of the ranger who will help you spot the gorillas. Trek can take 1- 5 hours therefore it requires a reasonable degree of fitness and a sturdy pair of walking shoes a sit might be slippery especially if it is during the rainy season. When you meet them, you will have an hour to sit in the forest among the gorillas, listening to them grumble to each other, marvel at the size of the silver back which is the dominant male of the group. The forest other attractions like lots of tree ferns, orchids and Bwindi’s colorful array of butterflies, birds and primates from the forest. Overnight will be at your lodge. Luxury; Lake Mburo safari lodge/ Mantana Luxury tented camp / Mihingo lodge. After breakfast, you will go for a nature walk which will lead you to the salt lick where animal gather around to lick the salty soil and here you will see lots of animals. A walk to the near by salt lick is a summary of your trip to Lake Mburo but this is done without the animal’s conscience as they may run away if they sense danger from the humans. Later on, you will return to the lodge for lunch and then later in the afternoon, you will go for a canoe ride along Lake Mburo to see the hippos, the crocodiles, the water birds, among other attraction. You will then return to your lodge for dinner and over night. Have your breakfast and then transfer to Kampala. Depending on your time of your departure, you may go for a partial City tour for example, go shopping for the African stuff from the city craft shops, there, you can get some souvenirs and then have your drive drop you at the airport to catch your flight back home.